Pet Lifestyle Advisor and author Wendy Nan Rees offers advice on how dog stairs can be convenient for more than just senior pets. Learn about the benefits for puppies, small breeds, and dogs with illness or disabilities. I've been getting emails lately from people whose pets are losing their mobility and can no longer climb and jump the way they used to. I've also heard from owners who can no longer physically lift their pet to offer extra help. I have always had two large dogs and one very small dog, but for some reason my small dog could always jump up onto the bed, into the car or onto our boat without any difficulty. So, it honestly never crossed my mind about the problem people have dealing with a dog that needs extra help. However, many pet parents have to deal with a very young or elderly animal that struggles to get up on the couch, bed or other favorite resting place. So, I began doing some research, and I found out that ramps and stairs are not just for older dogs. In fact, these items can be a real convenience for both dogs and the people who love them. What I love about my job is that after 25 plus years, I learn something new every day, and I am happy that I can share that information with you all. Please know if you too have a puppy or small breed dog, not all of them can or will jump up. It is okay; you don't have to stress out about it. Pets are more than companions; for many people they are family members who are participating in outings and vacations. As summer approaches, more and more people begin to think about hitting the road, but they do not want to leave their pet behind. During these excursions, making young, elderly, or injured pets comfortable is important to their health and safety. A set of dog stairs makes that more possible. What I have learned is that many small breeds, like the Dachshund, could use a ramp or stairs all the time. They have a naturally long back, which if not take care of can get knocked out of alignment and become very painful. Even the healthiest pet is susceptible to joint or spinal injuries due to jumping. Many breeds with long spines and short legs are at substantially higher risk. Dog stairs and even ramps can reduce this risk by absorbing much of the impact shock and by reducing your pet's need to jump up or down from furniture, beds, etc. The reason that they do this so well is because they are made of high density foam. While researching this topic, I found a commentary from a vet at PuppyStairs.com, and I want to share it with you. Dr. Peter H. Eeg, DVM, talked about how a set of dog stairs or a ramp could reduce the stress put on animals' joints whenever they hyperextend their hips or back. This kind of movement can be especially painful for a dog that suffers from arthritis or various neurological problems, and it often exacerbates the condition. Dr. Eeg felt a set of dog stairs could benefit a dog that suffers these problems. So, the convenience of using dog stairs isn't just reserved for older pets, and you can avoid having to lift your dog whenever he wants to join you. I hope this tip will help owners of any dog that needs a hand up. If your doggies have begun to show signs that they just do not want to jump into the car or onto the bed, don't panic. 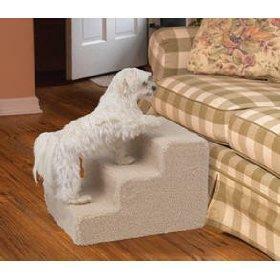 Just try one of the many wonderful, affordable styles of stairs or ramps available for our four-legged best friends.